I’ve always had a love affair with carbs. Bread. Pasta. Potatoes. Cupcakes. Cookies. Brownies. Beer. Those are a few of my favorite things. But we all know that carbs aren’t exactly the best thing for us to eat. They can be pretty unhealthy, especially when the carbs consumed consist of refined carbs and they aren’t too friendly to our waistelines. I really enjoy a good baked potato, a heaping serving of mashed potatoes, and various potato casseroles. But alas, I’ve decided to reduce my carb intake again. It won’t be a drastic reduction but I’m going to sub some high carb side dishes with low carb side dishes. 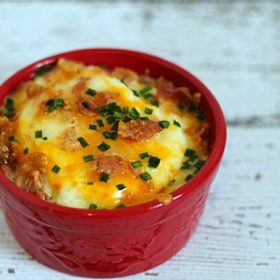 Which brings me to the recipe that I will be sharing with you today: Mashed Cauliflower Mini Casseroles. If you’re looking for a low carb recipe that’s a perfect substitute for mashed potatoes or baked potatoes, then this is your recipe. Cauliflower has such a mild taste that it’s hard to believe that this casserole is in fact made with cauliflower rather than potatoes. If you’d rather not have mini casseroles, then just pour the mixture into a small casserole dish instead of the ramekin. I hope you enjoy this recipe! This low carb recipe is a great alternative to baked potatoes! Individual servings are perfect for grab and go meals or freezing for future use. Bring a large pot of water to a boil (add a dash of salt to the water.) Add the cauliflower and cook until tender. Drain the cauliflower and place in a mixing bowl. Puree with an immersion blender. Add the heavy cream, butter, salt and pepper and mix well. 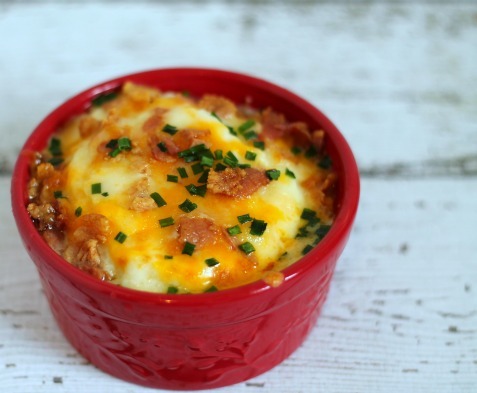 Spoon the cauliflower mixture into ramekin bowls and top with the shredded cheese and bacon bits. Place the casseroles on a baking pan and place in the oven. Broil on high for a few minutes until the cheese is bubbly. Be sure to watch the broiling as to not let the cheese burn. It doesn’t take long to get it bubbly. Remove from the oven and top with chives. OH YUM!! I love the idea of making these mini dishes! I’m pinning this — always looking for different side dishes to serve — thanks! These look awesome. I plan to try them soon. Thanks for sharing this recipe Julie. Question if I made a few of these and wanted to freeze them do you think they would freeze well? I love serving cauliflower instead of potatoes and am always in search of ways to add variety to my table. This recipe is, quite simply, perfect! Thank you!! Yum! This looks delish! I can’t wait to try it out:) Pinned! This will make three 6oz ramekins. You would probably need to double this for 8 people! Thank you very much for the prompt reply…. we are anxious to try this…. I bought the ramekins… I think it looks good in them… again thank you so much..
I’m not sure what you’re trying to ask. Do you have a question about the cooking method? Please let me know so I can help you out. These look delicious and in the little serving size dishes I bet you can freeze them and just bake when needed. It’s like loaded mashed potatoes but healthier! Visiting from What’s for Dinner link up. Pinned! What a great recipe and it looks delicious! I’d love for you to share over at a new party called Let’s Party https://themarkandjanshow.com/2018/01/02/lets-party-6/ … we look forward to seeing you there! I have reduced my carbs and this recipe sounds amazing. I love any recipe with cauliflower so adding this to my low carb recipes. Found you at the WOW party. Thanks for sharing at the What’s for Dinner party! Hope the rest of your wee is fabulous! What a great idea – combining portion control with a low carb swap. We’ve switched to a low carb lifestyle and while I’ve made mashed cauliflower before, it didn’t occur to me to do “Loaded bake Potato Style” or to do it in smaller dishes. Your Mashed Cauliflower looks delicious and I can’t wait to try it! Thanks so much for sharing with us at Full Plate Thursday. Oh yum! Looks and sounds delicious!! Thanks for sharing the recipe with SYC.